The Panamanian boxer had 14 memorable fights in Las Vegas, including six straight wins. He’s being inducted into the Nevada Boxing Hall of Fame on Saturday at the Tropicana. The first time he fought in Las Vegas, Roberto Duran enjoyed a successful night in the ring at Caesars Palace. He also had a good time after the fight, drinking well into the night and winding up drunk. It was Jan. 21, 1978, and Duran stopped Esteban De Jesus in the 12th round of what was a scheduled 15-round contest as he remained lightweight champion of the world. And for a while, Las Vegas would be very good to Duran, who would win six straight fights in the city. But then things flipped. In 1982, Duran lost a 15-round decision to Wilfred Benitez at Caesars followed by losses to Marvin Hagler, Thomas Hearns, Robbie Sims and his archnemesis, Sugar Ray Leonard, in the first fight at The Mirage in 1989. He never won again in Vegas, finishing 6-8 in his 14 appearances. But the man from Panama known as Manos de Piedra (Hands of Stone) who would win titles in multiple weight classes and posted a record of 103-16 with 70 knockouts, had made enough of a name that the Nevada Boxing Hall of Fame voted him in. Duran, along with 17 others, will be inducted as the second-ever class in ceremonies at 6 p.m. today at the Tropicana. 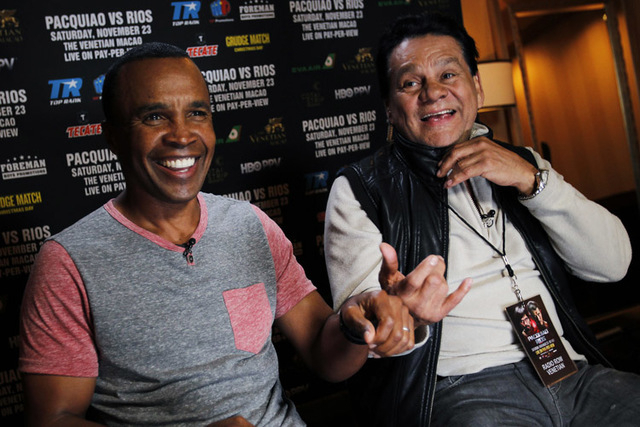 Duran vividly recalls the De Jesus fight. He was the lightweight champion and he put his World Boxing Association title on the line against De Jesus, who was from Puerto Rico and was the World Boxing Council champ. “It was a proud moment because you had two Latino fighters doing battle in Las Vegas,” Duran said. “It was a tough fight. De Jesus was a very good fighter. Duran enjoyed all the trappings that came with being a champion fighter when he would compete in Las Vegas. Caesars would put him up in its Frank Sinatra Suite, a two-level penthouse. Duran remembers walking down the stairway and singing, pretending he was Sinatra. He once got to meet Sinatra and gave him a pair of autographed boxing gloves. Duran said his losing streak in Las Vegas began when Ray Arcel and Freddie Brown, who had guided him through the early stages of his career, left him after the rematch with Leonard in 1980, the infamous “No Mas” fight that saw Duran quit in the eighth round. Duran’s last appearance came in 1998 when William Joppy stopped him inside of three rounds at the Las Vegas Hilton. He was 47 years old and was making one last stab at being world champion, fighting for the WBA middleweight belt. Duran believes he could have stopped the losing streak in 1989 when he and Leonard opened The Mirage on a chilly early December night. The rubber match, nine years in the making, was Steve Wynn’s first fight in his new hotel. Wynn and former Caesars CEO Clifford Perlman are also being inducted into the hall tonight as special contributors. Duran said he and Leonard have been friends for a while and any animosity he may have harbored toward his rival has long since passed.